Visualize the lamina underneath the hoof. The coronary band serves as a decent landmark for trimming horse hooves. I say decent because it can be distorted, but without X-rays, I have to rely on outward signs in the hoof. 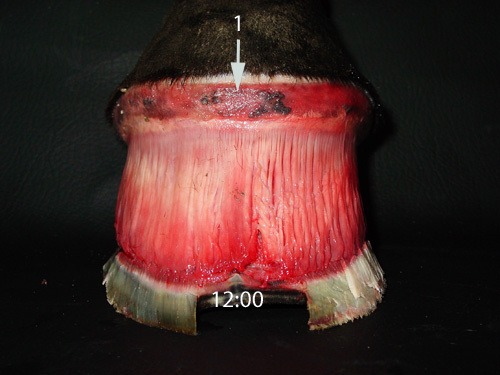 Unless there is lots of coffin bone loss, the lamina taper with the longest starting at the toe of the hoof and taper back towards the heels. Despite deformities in hoof shape, I rely on this to be a general rule. 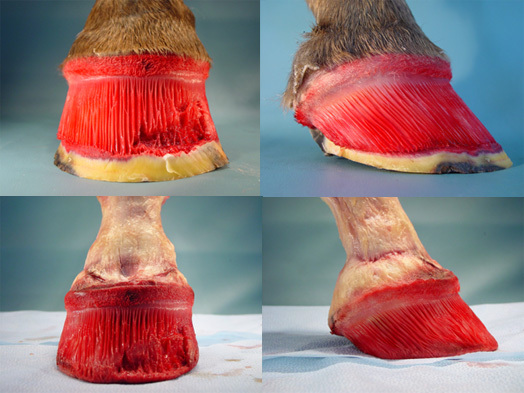 Here are some pictures that simply show how the lamina taper from the front of the hoof to the back. This appeared to be a reasonably healthy hoof. The coronary band is marked with arrows and the number 1. Notice how the lamina are longer at the toe (12:00) and much shorter at the heels (7:00). If you are confused by my reference to the clock, please go to this page on my website. Once again, I have marked the coronary band with an arrow and the number 1. The center of the toe is 12:00. The lamina are longest here. If you continue thinking in terms of a clock, can you imagine that 11 and 1 are approximately the same length? What about 10 and 2? Notice they get progressively shorter as you move back on the foot? The lamina looks a little rough in these pictures because some of it pulled away when I peeled the hoof capsule off. I had a helper bee the day I did this dissection. Picturing how the coffin bone is oriented in relation to the coronary band is especially helpful when faced with extreme hoof deformity. It helps me keep my bearings as I trim a foot like this. 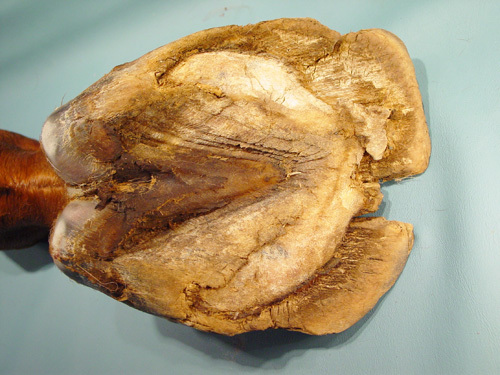 The top of the coffin bone (extensor process) is even with the hoof wall in a healthy foot that does not have distal descent. Sometimes the coffin bone has slipped lower in the hoof capsule, but it is easy to adjust my trim to allow for that. 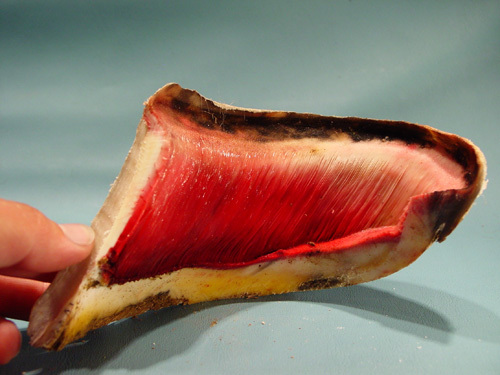 When faced with a foot that looks extremely long or tall, I tend to err on the side of caution and assume the coffin bone has slipped deeper in the hoof capsule and is not even with the coronary band. If I suspect this to be happening, I still taper the foot from the front to the back, but leave the foot longer over all. I try to not over think what needs to be done, especially with a new horse. I am patient and rough in balance. This is where I begin. This is how the lamina taper back even in this horribly over grown hoof. I've left the sole on this foot. I thought you would be interested to see how thick it was. Here is the sole before I removed the hoof capsule. The bars have grown all the way around the apex of the frog. The notch at the front of the toe indicates some bone loss. There are other issues with this foot. It was clearly not a healthy foot or horse. The dark color on the lamina is freezer burn. I did not dissect this foot as soon as I would have liked. It affected the tissue quality. This hoof has different problems. I suspect there is some distal descent of the coffin bone (the coffin bone is lower in the hoof capsule). 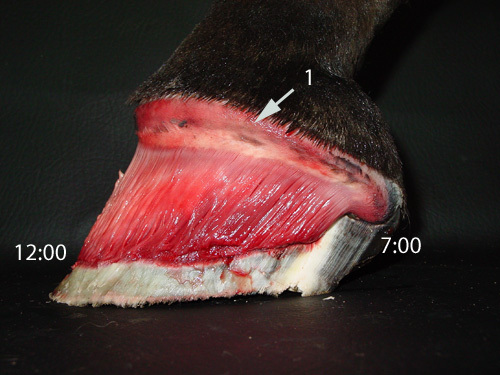 I suspect this for two reasons, there is a slight dip in the coronary band at the very front of the hoof and the foot looks abnormally tall, yet the wall was not higher than the sole. Some of the lamina pulled away from this foot too. I hope this helps you visualize the inside of the hoof. I have found that the more I understand the internal structures, the more comfortable I am when trimming.